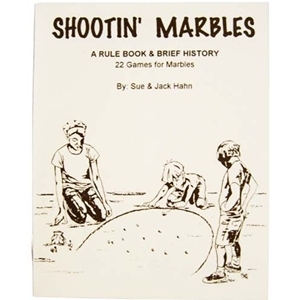 "Shootin' Marbles, A Rule Book and Brief History" contains rules for 22 games for marbles, a brief history of the game of marbles, nicknames for marbles, and a bibliography for those interested in marble collecting. 30 pages packed full of information. Written by Sue and Jack Hahn. To see examples of the rules for 4 of the games in this book, go to the "just for fun" page on this website.